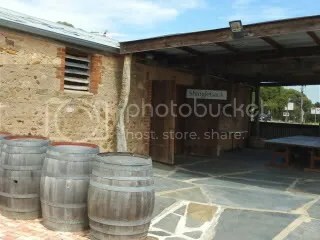 Shingleback Wines Cellar Door has the distinction of being the first cellar door you drive past or to as you enter McLaren Vale’s main street. They moved into the current facility a few years ago after being in the Tourist Infoamtion Centre and have not looked back. The renovated old building looks great and is set up with lounges and art for those that may want to linger or those who are driving and not wanting to have a drink. The facility has a lot of room so they can set up well for functions. For the Sea & Vines Festival they put on a great show. 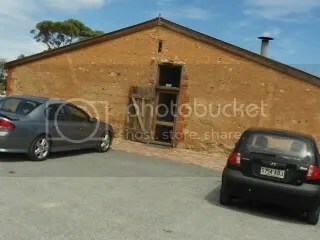 Shingleback’s vineyards are on the flat between McLaren Vale and Willunga. They are close to Fox Creek Wines – I used to work for Fox Creek so I like the association. I found some close flavor profiles – particularly with the sparkling red between Shingleback and Fox Creek. The tastes of McLaren Vale are here for all to see and taste. I find one of their marketing ploys as fascinating – they have a buy 2 and get a third wine at equal or lesser value (not for the Show Wines). This makes their wine seem to be better value to the customer and the winery gets more volume sold -quite simply the potential for a wine – wine situation. This could be a 2 edged sword as some people may take offense to such a strategy, however I am told that the strategy is seen very favorably at the cellar door so well done guys! There is now a restaurant open next door to the facility – I will talk about this more next week. Fruit driven entry level wines – $15/bottle or $30 for 3. The aromas are quite distinctly missing – maybe the wine was a bit cold. The flavors are true to variety (melons) and there was not as much of an acid finish as I was hoping for. A soft drinking style that is not necessarily a food wine – just drink it with friends on a Sunday lunch. Your basic Rose – strawberry and rose water mixed with a real acid backbone. Another one for a hot weekend lunch wine. I got a distinct aroma layer of red fruits (red currents and raspberries) with a perfume ending. This is a real fruit driven wine with all fruits you expect from this blend – red fruits from the Grenache and some fruit tannin and backbone from the Shiraz and Mourvedre. If you have not tried this blend before and like fruit driven wines then this is a great start. The wine is under a Zork closure as part of a trial. At first I was concerned about this wine as I got almost no aromas from my tasting glass with this wine. What I tasted was completely different – nice black current fruit (as expected) combined with fruit based tannins (skins etc) that are quite fine. The real thing that got me here was the acid levels that left the tongue tingling. I can see my favorite beef and chilli pizza going down well with this one. Again the aromas were closed here. The flavors are what you expect from a fruit driven Shiraz – particular emphasis on plums. The acid level is again nice and high and the tannins are quite fine and smooth. Soft everyday drinking with a BBQ written all over it. Mid level wines $18/bottle or $36 for 3. The grassyness of the Semillon comes through as the dominant aroma with some passionfruit there as well (from the ripe Sauvignon Blanc). There is a real citrus component here – probably from the Semillon. I found the wine a bit lacking in the mouthfeel department so it would be a pass for me. The wine saw co-fermentation of Viognier skins and the Shiraz. The aromas of plum also have a lift that you get from the co-fermentation. I could definitely taste the apricots one expects from this blend but it was just a little apricotty for me. As you would expect this is a step up and the wine delivers. With a 2006 wine there was a number of developed flavors here mixed with licorice all over the place. The flavors are what McLaren Vale seems to produce the best – chocolate and licorice. There is a fruit sweetness here also that goes straight into a mouth full of fresh plum character. The tannins are fine and not over powering. With the fruit basis of te wine, I would choose a dish of Chicken in Red Wine. Check out Part 2 of this review to read all about the Shingleback wines plus the rest of the Show Wines. This entry was posted in Mclaren Vale, wine and tagged Australia, Cabernet Sauvignon, cellar door, Chardonnay, Grenache, Mclaren Vale, McLaren Vale Wine, Mourvedre, Oak, Sauvignon Blanc, Shiraz, wine, wine McLaren Vale, Wine tasting descriptors. Bookmark the permalink.